Help, advice and interesting articles to grow your confidence. We all have self talk, it is that voice inside our head that we use to hold discussions with ourselves. These discussions are important, especially when it comes to what you are saying about yourself. WHY? Basically, what we say about ourselves, to ourselves, we will accept as truth. Now, this is great when we are saying something helpful. However, and as can be often the case, this self talk can be less than helpful. Self doubt is fed by these negative conversations that you hold with yourself. When feeling less than confident we can also say things like "I told you so" or "it will never work". The good news is you can change how important and impactive that negative self talk can be. How to change the importance of negative self talk. Can you remember a time when you wanted to try something new or do something different and your self talk was less than supportive? That little voice inside says something like "it won't work", "you can't do that", "they won't like you" or something equally as unhelpful. While thinking about that time, can you hear or feel where it comes from? Is it your own voice or someone else's? Lets change it up a little to take the importance from what it is saying. Would the voice still be as important if you made it so quiet and far away that you could barely hear it? Now, how about if that voice sounded like Mickey Mouse or like someone who had just inhaled helium? Perhaps you could even add some comical music to the background of that voice. I totally recommend the circus music as it always brings a smile to my face. When you think about times that you have talked negatively about yourself inside your mind, MAKE THE CHANGES as in Step Two. That negativity will have way less importance and probably even seem silly! How great is that. The great thing about this technique is that you can also use it on live self talk. Rather than changing memories, if you notice you are talking to yourself in a negative way make the same changes and BOOM. You are going to be taking less notice of that silly voice, saying silly stuff. If you want to find out more about how I can help you click HERE! Our confidence can get knocked when we set out to do something and all of a sudden what we have done causes all sorts of problems. If this happens over and over, we tend to become afraid of making decisions or planning goals. It does not have to be that way. We have all got some really good ideas about what we should aim for in life (whether at work, socially or at home). If you are anything like me then you will most likely have been caught unaware by the side effects of achieving your goals or doing one thing rather than another. Being surprised by the knock on effect of realising a particular goal is caused by not checking the ecology of that goal. This time of year I get asked this a lot. "Marcus, how come you have the success you do?" Wait a minute before you disappear off somewhere else. Accepting that I am responsible for my wins and losses in life actually empowers me to be more successful. In years gone by I would find reasons and excuses to justify when things didn't go well. Whilst this was great to deflect responsibility it meant that I never changed. I would keep doing the same thing time and time again and get the same results time and time again. Time and time again I would point out all the reasons that I did not succeed. The reality was that each time I found an excuse or reason, I was giving away my personal power to do anything about it I was also missing out on valuable learnings. This was not helpful. So, I accepted that I was responsible for what happened to me and my results. After all, we are who and where we are today, due to the sum total of our own conscious and unconscious decisions. Accepting responsibility allowed me to reclaim the power that I had been giving away to others or circumstances. With this power I was able to take the learning that I needed and then change my behaviour. I became response-able. I became successful. In short, I am successful because I am no longer a cork bobbing about on the seas of life at the mercy of the weather and currents. I am now the captain of my own luxury yaucht, taking in all the information available before charting my course. If things do not go to plan, I change my behaviours and plan to take account of the new information. Make 2018 the year you learn to be the captain of your own ship. Get in touch for a free discovery session today. Two seeds were underground and talking with one another. The first seed's view was that they should grow, burst through to the surface, let their foliage feel the sunlight and have their beautiful flower admired. The second seed felt safe underground and was fearful of insects eating its leaves or having its beautiful blooms picked by admirers. The first seed grew and flourished, realised its potential. The second seed was safe. Confidence is in you, me, everybody. When we compete against others we are focusing energy, emotion and resources on activities that are not beneficial to us. We are not someone else, we are us. Why spend time trying to be someone else, when you are perfectly fabulous and indeed the only person that can be you. Just remember, the job of being someone else is already taken. Too often we focus on the past, we dwell on it. As a result we never leave the past behind, we get stuck and repeat old mistakes. Learn what you need to learn and move on. Projecting a positive future is what we need to do to enable our brains to know what we want. When we know what we want, our reticular activation system will do all it can to give you the future you want. Focus your attention on what you want, this will give you an air of positivity in everything you do. Drawing your attention to what you don't want, will only bring what you do not want. Our brains do not process negatives. It is easy to notice what we do not have, what we wish we had. Sometimes we need to look at what we already have. Looking at how lucky and blessed we already are can reinforce the positive feelings inside and help us realise we are already good people and confident. Time for a change in your thinking? Well, it is all very well and good to say it is time for a change. It all sounds great I hear you say, but how do I do it? Is this thought I am having, helping me. Right here, right now? What advice would you tell a good friend who thought this? Once you have challenged that negative thought, think about times that this thought has not been true and focus on your good qualities. Changing how you think can lead to changing habits. Changing from negative thoughts to positive can bring great change in your life. If you want to improve your confidence, sign up for our top five tips for confidence TODAY or get in touch to arrange a free consultation. The secret to being confident is to believe that you have it already. Sometimes though, we need a helping hand in believing it. SIGN UP to download our top five tips for confidence, NOW. Believe the message in the picture and you will find that confidence comes a lot easier to you. SOMETIMES, IT IS THEM AND NOT YOU. Have you ever had one of those days where people seem to be grumpy around you? Do you ever feel that you have upset someone and yet you don't know what it is you have done? If so, here is a truth that you need to know. YOU CAN STOP BEATING YOURSELF UP, RIGHT NOW. I want to say, here and now that, many of the times that you feel or experience the above, it is NOT YOU. I know that you look at people like Derren Brown or Paul McKenna and say, "well, they can make you think things" This is not true. They do not make anyone think anything. The people that they work with think what they want to think. The person on stage or listening to a CD on how to make your life a success is in charge of their own mind and are only doing and thinking what they want to think. Human beings have no magic buttons to press that make you feel one thing or another. It is all choice. This may be hard to accept as there are many times in life where you feel you have no choice and I am not saying that there are no times in life that you should choose to feel sad or grumpy, because there are. What I am saying is that choose when you want to expend that sadness wisely. The reality is that this is an illusion, there is always choice. As such, when the people around you are grumpy or annoyed, this is their choice. The other thing to consider is that whilst you may think the individual you work with, your best friend or partner is upset at you, they may well not be. You do not know what they are dealing with outside of your knowledge and this could be what is causing them to express themselves in the way they are. It was nothing to do with you after all. So, right here and right now, I want you to stop finding reason to blame yourself about how someone else chooses to react and feel. What is a confident woman? Confidence comes in all shapes and sizes. It is not something that is on the outside. Confidence is something inside, something that you create yourself. How you feel is up to you. It sounds simple, and it is. We are different from the animal kingdom in that we are not driven by instinct alone. This gives us the benefit of choice. Choice in how we react or choice in how we feel. How many times have you heard someone say "that makes me sad" or "that makes me feel less confident". Have you said it? I know I have (in the past). The problem with this is, you are giving your power away to someone or something else. You are allowing this other person or entity to control your emotions and feelings. The key to success and confidence is realising that you are in charge of your own mind. You can choose what to feel and when to feel it. I challenge you to realise that you knew this all along, you know! A confident woman is one that knows she is in control of her own mind. If I had a pound for each time that a client came to me with a lack of confidence in their own body, I would be a rich person. What would life be like if you were happy with how you looked? How great would you feel if you didn't have that voice of self doubt over your appearance? I can help you with this and to start you off I will give you first three things I tell a client with body confidence issues. Stop comparing yourself to the perfect images that you see on Instagram, Facebook, Glamour Magazine etc. The reality is that these images have had filters applied to them, or even been airbrushed to hide the imperfections. By comparing yourself to a false image of perfection you are conning yourself into believing you are not good enough. The reality is that the people you are seeing in these images very rarely resemble the finished image. You are your own worst critic, and other people are too busy criticising themselves to be worried about how you look today. How we look is not as important as the person you are. By this, I mean that whilst it is important to make the best of what we have in terms of looks, it is much more important to be the best person you can be. For example. Did you choose your best friend because they were the best looking person you know? Unlikely. Did you choose your best friend because of the fact they made you laugh, have similar interests and you could trust them? Probably. 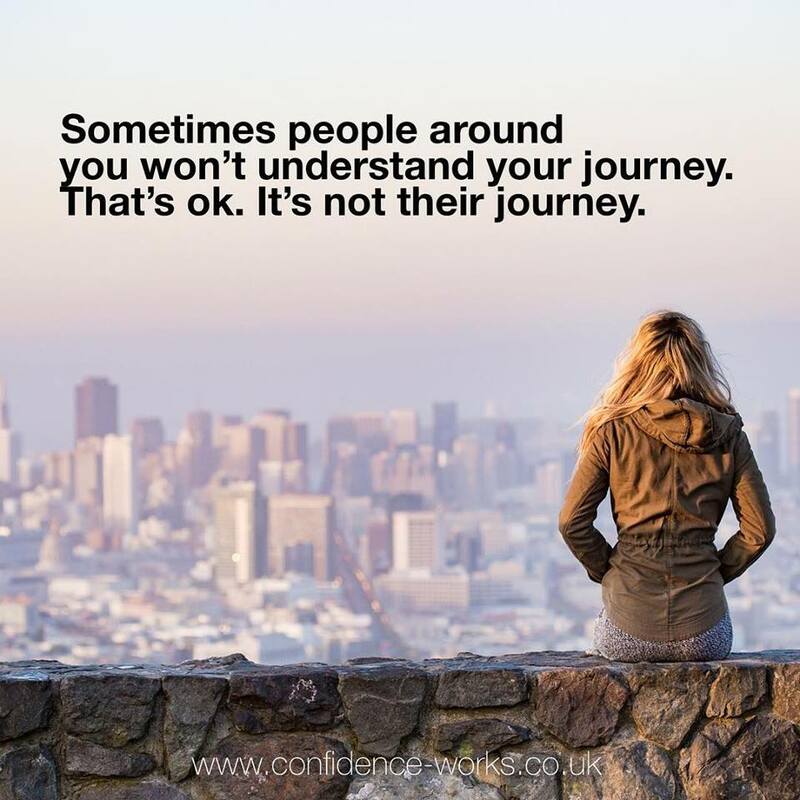 I have helped so many people realise that they are fine, just the way they are. Is it not time that you chose not to spend time worrying about how you look and spend that time enjoying the person you are? Get in touch for a free consultation. I don't have many space left this week so get in touch soon. Worry less about tomorrow and live in the now. A confident person understands that we live in the now. What does this mean? The past is exactly that, it has gone and should not be allowed to negatively impact upon the present. It is only right that we learn from the past and take any positive learning to help us later on. However it is important not to dwell on the past and beat ourselves up. This can lower our confidence levels and self belief. Another aspect of living in the now is that we do not worry about tomorrow. By all means plan ahead and prepare. Once you have done this, all you can do is focus on the now and wait for tomorrow to come. To worry about what might happen tomorrow is unhealthy and can lead you to question your actions before you have even taken any. This undermines your confidence and self belief. Living in the now means that you learn from the past and prepare for the future. Do not dwell on the past or worry about things that have not happened yet. Confident people understand the past has gone and the future has not arrived yet. They learn what they need to learn and prepare as best they can for tomorrow. Want to be a people person? Are you one of the people that dread party invites, introductions or striking up that converstation with that special someone? If so, I am here to help you realise this does not have to be the case. It all starts with your thinking. "I'm just not a people person" you think to yourself as you walk into the pub, club or meeting. Well, you are probably right. As long as you keep telling yourself that, you are not going to be one. The first thing to do is forget what you think you know about yourself. The more you tell yourself something, the more you will believe it. So, that old way of thinking that "I'm just not a people person" has to go. Replace it with an open mind and heart. Take each opportunity to meet people as a fresh start, a fresh chance to make new friends and contact. Secondly you should know that pretty much everyone gets nervous and that this is OK. Those confident people around you, they are likely to be just as nervous as you. The secret that they know, the one that you now know, is that it is ok if people do not like you. If things do not go to plan, do not take it personally. After all, the person you are speaking to might be having the day from hell. Change your thinking, engage your people power. DO YOU FIND THAT YOU ARE THE VICTIM OF CIRCUMSTANCE OR BAD LUCK? Take control and gain the confidence to make change for the better.